Katherine Gaskill’s professional career has gone to the dogs … and cats … and perhaps even a few horses. A 2018 graduate of Pensacola State College’s Veterinary Technology Program, Gaskill recently passed the Veterinary Technician National Examination and is now a registered veterinary technician. She has accepted a position as an intensive care unit nurse at Oklahoma State University’s Boren Veterinary Medical Hospital. “I do pretty much what you expect a human nurse to do in the critical care emergency department. It’s just cats and dogs instead of people,” said Gaskill as she explained what being a registered veterinary technician entails. The hospital has the facilities to provide 24-hour case management for horses, farm animals, small ruminants, camelids and small animals (dogs, cats, exotics) that have critical care needs. If an animal is suffering from a medical condition that makes them unstable, recovering from surgery or experiencing complications, Gaskill monitors the animal and can alert the on-call veterinarian in the event of an emergency. She added that OSU-BVMH is the only small animal department in Oklahoma that is open 24 hours a day. Gaskill first attended Pensacola State in 2005 and earned her associate degree in general studies. She went on to attend Auburn University and graduated in 2009 with her bachelor’s degree in Animal Science. Gaskill spent the next several years working with animals in a variety of capacities: herd management, animal training, zoo keeping, riding instruction, wrangling and handling birds of prey. In fall 2016, she returned to Pensacola State to enroll in the veterinary technology program. 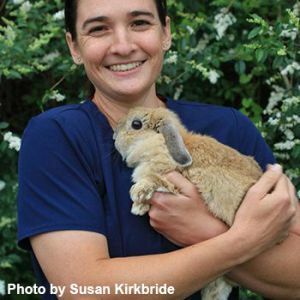 Enrolling at the college may have been easy, but Gaskill found the veterinary technology program to be challenging and rewarding. Gaskill said the veterinary technology program is not all fun and games, and that she had to put in some serious studying. She added the support of her friends and the scholarships she received, along with the skill of her Pensacola State instructors, provided her with the tools she needed to succeed. “Dr. (Norma) Berberich was one of the best professors I ever had, period,” she said. Gaskill, a self-proclaimed “workaholic,” says when she’s not working, she is usually doing research. She said she likes to read (a lot), ride her horse or take her dog hiking when she manages to find a little free time. So, what’s next for Gaskill?